"Father, Son, Holy Ghost"; "Holy Trinity"; and "Trinitarian" redirect here. 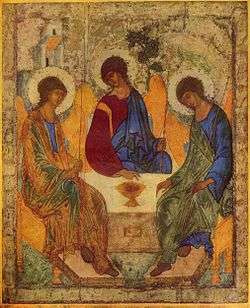 For the related liturgical observance, see Trinity Sunday. For the album, see Father, Son, Holy Ghost (album). For other uses, see Holy Trinity (disambiguation), Trinitarian (disambiguation), and Trinity (disambiguation). The Christian doctrine of the Trinity (Latin: Trinitas, lit. 'triad', from trinus, "threefold") holds that God is three consubstantial persons or hypostases—the Father, the Son (Jesus Christ), and the Holy Spirit—as "one God in three Divine Persons". The three persons are distinct, yet are one "substance, essence or nature" (homoousios). In this context, a "nature" is what one is, whereas a "person" is who one is. According to this central mystery of most Christian faiths, there is only one God in three persons: while distinct from one another in their relations of origin (as the Fourth Lateran Council declared, "it is the Father who generates, the Son who is begotten, and the Holy Spirit who proceeds") and in their relations with one another, they are stated to be one in all else, co-equal, co-eternal and consubstantial, and each is God, whole and entire". Accordingly, the whole work of creation and grace is seen as a single operation common to all three divine persons, in which each shows forth what is proper to him in the Trinity, so that all things are "from the Father", "through the Son" and "in the Holy Spirit". While the Fathers of the Church saw even Old Testament elements such as the appearance of three men to Abraham in Book of Genesis, chapter 18, as foreshadowings of the Trinity, it was the New Testament that they saw as a basis for developing the concept of the Trinity. 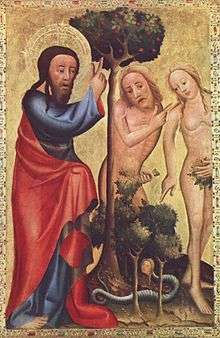 The most influential of the New Testament texts seen as implying the teaching of the Trinity was Matthew 28:19, which mandated baptizing "in the name of the Father, and of the Son, and of the Holy Spirit". Reflection, proclamation and dialogue led to the formulation of the doctrine that was felt to correspond to the data in the Bible. The simplest outline of the doctrine was formulated in the 4th century, largely in terms of rejection of what was considered not to be consonant with general Christian belief. Further elaboration continued in the succeeding centuries. Scripture contains neither the word Trinity, nor an expressly formulated doctrine of the Trinity. Rather, according to the Christian theology, it "bears witness to" the activity of a God who can only be understood in Trinitarian terms. The doctrine did not take its definitive shape until late in the fourth century. During the intervening period, various tentative solutions, some more and some less satisfactory, were proposed. Trinitarianism contrasts with nontrinitarian positions which include Binitarianism (one deity in two persons, or two deities), Unitarianism (one deity in one person, analogous to Jewish interpretation of the Shema and Muslim belief in Tawhid), Oneness Pentecostalism or Modalism (one deity manifested in three separate aspects). 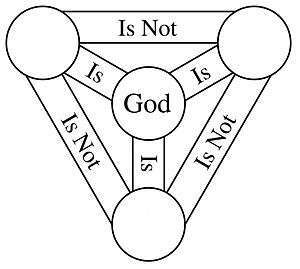 The word "trinity" is derived from Latin trinitas, meaning "the number three, a triad". This abstract noun is formed from the adjective trinus (three each, threefold, triple), as the word unitas is the abstract noun formed from unus (one). Tertullian, a Latin theologian who wrote in the early 3rd century, is credited as being the first to use the Latin words "Trinity", "person" and "substance" to explain that the Father, Son, and Holy Spirit are "one in essence—not one in Person". The Ante-Nicene Fathers asserted Christ's deity and spoke of "Father, Son and Holy Spirit", even though their language is not that of the traditional doctrine as formalised in the fourth century. Trinitarians view these as elements of the codified doctrine. Ignatius of Antioch provides early support for the Trinity around 110, exhorting obedience to "Christ, and to the Father, and to the Spirit". Justin Martyr (AD 100–c. 165) also writes, "in the name of God, the Father and Lord of the universe, and of our Saviour Jesus Christ, and of the Holy Spirit". The first of the early church fathers to be recorded using the word "Trinity" was Theophilus of Antioch writing in the late 2nd century. He defines the Trinity as God, His Word (Logos) and His Wisdom (Sophia) in the context of a discussion of the first three days of creation. The first defence of the doctrine of the Trinity was in the early 3rd century by the early church father Tertullian. He explicitly defined the Trinity as Father, Son, and Holy Spirit and defended the Trinitarian theology against the "Praxean" heresy. St. Justin and Clement of Alexandra used the Trinity in their doxologies and St. Basil likewise, in the evening lighting of lamps. Another early, and already more philosophic, formulation of the Trinity (again without usage of that term) is attributed to the Gnostic teacher Valentinus (lived c.100 – c.160), who according to the fourth century theologian Marcellus of Ancyra, was “the first to devise the notion of three subsistent entities (hypostases), in a work that he entitled On the Three Natures”. The highly allegorical exegesis of the Valentinian school inclined it to interpret the relevant scriptural passages as affirming a Divinity that, in some manner, is threefold. The Valentinian Gospel of Phillip, which dates to approximately the time of Tertullian, upholds the Trinitarian formula. Whatever his influence on the later fully formed doctrine may have been, however, Valentinus' school is rejected as heretical by orthodox Christians. Of these controversies, the most significant developments were articulated in the first four centuries by the Church Fathers in reaction to Adoptionism, Sabellianism, and Arianism. Adoptionism was the belief that Jesus was an ordinary man, born of Joseph and Mary, who became the Christ and Son of God at his baptism. In 269, the Synods of Antioch condemned Paul of Samosata for his Adoptionist theology, and also condemned the term homoousios (ὁμοούσιος, "of the same being") in the sense he used it. Sabellianism taught that the Father, the Son, and the Holy Spirit are essentially one and the same, the difference being simply verbal, describing different aspects or roles of a single being. For this view Sabellius was excommunicated for heresy in Rome c. 220. In the fourth century, Arius, as traditionally understood,[note 1] taught that the Father existed prior to the Son who was not, by nature, God but rather a changeable creature who was granted the dignity of becoming "Son of God". 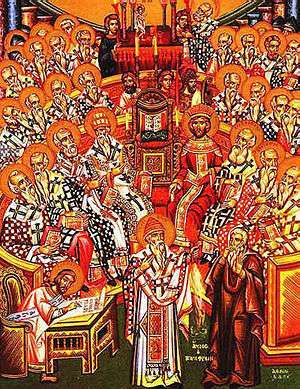 In 325, the Council of Nicaea adopted the Nicene Creed which described Christ as "God of God, Light of Light, very God of very God, begotten, not made, being of one substance with the Father". The creed used the term homoousios (of one substance) to define the relationship between the Father and the Son. After more than fifty years of debate, homoousios was recognised as the hallmark of orthodoxy, and was further developed into the formula of "three persons, one being". Athanasius (293–373), who was present at the Council as one of the Bishop of Alexandria's assistants, stated that the bishops were forced to use this terminology, which is not found in Scripture, because the biblical phrases that they would have preferred to use were claimed by the Arians to be capable of being interpreted in what the bishops considered to be a heretical sense. Moreover, the meanings of "ousia" and "hypostasis" overlapped then, so that "hypostasis" for some meant "essence" and for others "person". The Confession of the Council of Nicaea said little about the Holy Spirit. The doctrine of the divinity and personality of the Holy Spirit was developed by Athanasius in the last decades of his life. He defended and refined the Nicene formula. By the end of the 4th century, under the leadership of Basil of Caesarea, Gregory of Nyssa, and Gregory of Nazianzus (the Cappadocian Fathers), the doctrine had reached substantially its current form. In the synoptic Gospels the baptism of Jesus is often interpreted as a manifestation of all three persons of the Trinity: "And when Jesus was baptized, he went up immediately from the water, and behold, the heavens were opened and he saw the spirit of God descending like a dove, and alighting on him; and lo, a voice from heaven, saying, 'This is my beloved Son, with whom I am well pleased. '"[Mt 3:16–17] Baptism is generally conferred with the Trinitarian formula, "in the name of the Father, and of the Son, and of the Holy Spirit". 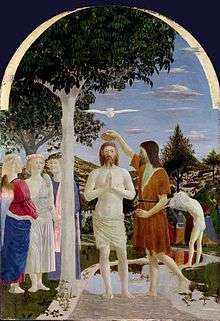 [Mt 28:19] Trinitarians identify this name with the Christian faith into which baptism is an initiation, as seen for example in the statement of Basil the Great (330–379): "We are bound to be baptized in the terms we have received, and to profess faith in the terms in which we have been baptized." The First Council of Constantinople (381) also says, "This is the Faith of our baptism that teaches us to believe in the Name of the Father, of the Son and of the Holy Spirit. According to this Faith there is one Godhead, Power, and Being of the Father, of the Son, and of the Holy Spirit." Matthew 28:19 may be taken to indicate that baptism was associated with this formula from the earliest decades of the Church's existence. Nontrinitarian groups, such as Oneness Pentecostals, demur from the Trinitarian view on baptism. For them, the formula in the Book of Acts defines and affirms that all other considerations, alike, are to be used in the name of Jesus Christ. For this reason, they often focus on the baptisms in Acts. Those who place great emphasis on the baptisms in Acts often likewise question the authenticity of Matthew 28:19 in its present form. Most scholars of New Testament textual criticism accept the authenticity of the passage, since there are no variant manuscripts regarding the formula, and the extant form of the passage is attested in the Didache and other patristic works of the 1st and 2nd centuries: Ignatius, Tertullian, Hippolytus, Cyprian, and Gregory Thaumaturgus. In the Trinitarian view, the Father and the Son and the Holy Spirit share the one essence, substance or being. The central and crucial affirmation of Christian faith is that there is one savior, God, and one salvation, manifest in Jesus Christ, to which there is access only because of the Holy Spirit. The God of the Old Testament is still the same as the God of the New. In Christianity, statements about a single God are intended to distinguish the Hebraic understanding from the polytheistic view, which see divine power as shared by several beings, beings which can and do disagree and have conflicts with each other. Perichoresis (from Greek, "going around", "envelopment") is a term used by some theologians to describe the relationship among the members of the Trinity. The Latin equivalent for this term is circumincessio. This concept refers for its basis to John 14–17, where Jesus is instructing the disciples concerning the meaning of his departure. His going to the Father, he says, is for their sake; so that he might come to them when the "other comforter" is given to them. Then, he says, his disciples will dwell in him, as he dwells in the Father, and the Father dwells in him, and the Father will dwell in them. This is so, according to the theory of perichoresis, because the persons of the Trinity "reciprocally contain one another, so that one permanently envelopes and is permanently enveloped by, the other whom he yet envelopes". (Hilary of Poitiers, Concerning the Trinity 3:1). Trinitarianism affirms that the Son is "begotten" (or "generated") of the Father and that the Spirit "proceeds" from the Father, but the Father is "neither begotten nor proceeds". The argument over whether the Spirit proceeds from the Father alone, or from the Father and the Son, was one of the catalysts of the Great Schism, in this case concerning the Western addition of the Filioque clause to the Nicene Creed. The Roman Catholic Church teaches that, in the sense of the Latin verb procedere (which does not have to indicate ultimate origin and is therefore compatible with proceeding through), but not in that of the Greek verb ἐκπορεύεσθαι (which implies ultimate origin), the Spirit "proceeds" from the Father and the Son, and the Eastern Orthodox Church, which teaches that the Spirit "proceeds" from the Father alone, has made no statement on the claim of a difference in meaning between the two words, one Greek and one Latin, both of which are translated as "proceeds". The Eastern Orthodox Churches object to the Filioque clause on ecclesiological and theological grounds, holding that "from the Father" means "from the Father alone". Most Protestant groups that use the creed also include the Filioque clause. Its controversial use is addressed in several confessions: the Westminster Confession 2:3, the London Baptist Confession 2:3, and the Lutheran Augsburg Confession 1:1–6. The term “immanent Trinity” focuses on who God is; the term “economic Trinity” focuses on what God does. The ancient Nicene theologians argued that everything the Trinity does is done by Father, Son, and Spirit working in unity with one will. The three persons of the Trinity always work inseparably, for their work is always the work of the one God. The Son's will cannot be different from the Father's because it is the Father's. They have but one will as they have but one being. Otherwise they would not be one God. 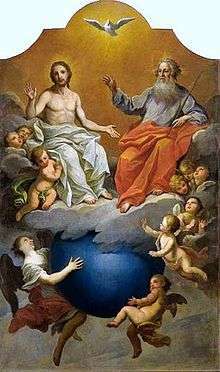 According to Phillip Cary, if there were relations of command and obedience between the Father and the Son, there would be no Trinity at all but rather three gods. On this point St. Basil observes "When then He says, 'I have not spoken of myself', and again, 'As the Father said unto me, so I speak', and 'The word which ye hear is not mine, but [the Father's] which sent me', and in another place, 'As the Father gave me commandment, even so I do', it is not because He lacks deliberate purpose or power of initiation, nor yet because He has to wait for the preconcerted key-note, that he employs language of this kind. His object is to make it plain that His own will is connected in indissoluble union with the Father. Do not then let us understand by what is called a 'commandment' a peremptory mandate delivered by organs of speech, and giving orders to the Son, as to a subordinate, concerning what He ought to do. Let us rather, in a sense befitting the Godhead, perceive a transmission of will, like the reflexion of an object in a mirror, passing without note of time from Father to Son." Roger E. Olson says that a number of evangelical theologians hold the view that there is a hierarchy of authority in the Trinity with the Son being subordinate to the Father. "The Gospel of John makes this clear as Jesus repeatedly mentions that he came to do the Father’s will." Olsen cautions, however, that the hierarchy in the "economic Trinity" should be distinguished from the "immanent Trinity". He cites the Cappadocian Fathers, "the Father is the source or “fount” of divinity within the Godhead; the Son and the Spirit derive their deity from the Father eternally (so there is no question of inequality of being). Their favorite analogy was the sun and its light and heat. There is no imagining the sun without its light and heat and yet it is the source of them." Benjamin B. Warfield saw a principle of subordination in the "modes of operation" of the Trinity, but was also hesitant to ascribe the same to the "modes of subsistence" in relation of one to another. While noting that it is natural to see a subordination in function as reflecting a similar subordination in substance, he suggests that this might be the result of "...an agreement by Persons of the Trinity -a "Covenant" as it is technically called -by virtue of which a distinct function in the work of redemption is assumed by each." Richard E. Rubenstein says that Emperor Constantine and his advisor Hosius of Corduba were aware of the usefulness of having a divinely ordained church in which the church authority, and not the individual, was able to determine individual salvation, and threw their support toward the homoousion Nicene formula. According to Eusebius, Constantine suggested the term homoousios at the Council of Nicaea, though most scholars have doubted that Constantine had such knowledge and have thought that most likely Hosius had suggested the term to him. Constantine later changed his view about the Arians, who opposed the Nicene formula, and supported the bishops who rejected the formula, as did several of his successors, the first emperor to be baptized in the Nicene faith being Theodosius the Great, emperor from 379 to 395. From the Old Testament the early church retained the conviction that God is one. The New Testament does not use the word Τριάς (Trinity) nor explicitly teach the Nicene Trinitarian doctrine, but it contains several passages that use twofold and threefold patterns to speak of God. Binitarian passages include Rom. 8:11, 2 Cor. 4:14, Galatians 1:1, Eph. 1:20, 1 Tim. 1:2, 1 Pet. 1:21, and 2 John 1:13. Passages which refer to the Godhead with a threefold pattern include Matt. 28:19, 1 Cor. 6:11 and 12:4ff., Gal. 3:11–14, Heb. 10:29, and 1 Pet. 1:2. These passages provided the material with which Christians would develop doctrines of the Trinity. Reflection by early Christians on passages such as the Great Commission: "Go therefore and make disciples of all nations, baptizing them in the name of the Father and of the Son and of the Holy Spirit"[Matt 28:19] and Paul the Apostle's blessing: "The grace of the Lord Jesus Christ and the love of God and the fellowship of the Holy Spirit be with you all",[2 Cor. 13:14] while at the same time the Jewish Shema Yisrael: "Hear, O Israel: the Lord our God, the Lord is one"[Deuteronomy 6:4] led the early Christians to question how the Father, Son, and Holy Spirit are "one". Later, the diverse references to God, Jesus, and the Spirit found in the New Testament were systematized into a Trinity—one God subsisting in three persons and one substance—to combat heretical tendencies of how the three are related and to defend the church against charges of worshiping two or three gods. Some scholars dispute the idea that support for the Trinity can be found in the Bible, and argue that the doctrine is the result of theological interpretations rather than sound exegesis of scripture. The concept was expressed in early writings from the beginning of the 2nd century forward, and other scholars hold that the way the New Testament repeatedly speaks of the Father, the Son, and the Holy Spirit is such as to require one to accept a Trinitarian understanding. The Gospel of John has been seen as especially aimed at emphasizing Jesus' divinity, presenting Jesus as the Logos, pre-existent and divine, from its first words, "In the beginning was the Word, and the Word was with God, and the Word was God. "[John 1:1] The Gospel of John ends with Thomas's declaration that he believed Jesus was God, "My Lord and my God! "[John 20:28] There is no significant tendency among modern scholars to deny that John 1:1 and John 20:28 identify Jesus with God. John also portrays Jesus as the agent of creation of the universe. There are also a few possible biblical supports for the divinity of Jesus found in the Synoptic Gospels. The Gospel of Matthew, for example, quotes Jesus as saying, "All things have been handed over to me by my Father. "[Mt 11:27] This is similar to John, who wrote that Jesus said, "All that the Father has is mine. "[John 16:15] These verses have been quoted to defend the omnipotence of Christ, having all power, as well as the omniscience of Christ, having all wisdom. Some have suggested that John presents a hierarchy when he quotes Jesus as saying, "The Father is greater than I",[14:28] a statement which was appealed to by nontrinitarian groups such as Arianism. However, Church Fathers such as Augustine of Hippo argued this statement was to be understood as Jesus speaking in the form of a man. As the Arian controversy was dissipating, the debate moved from the deity of Jesus Christ to the equality of the Holy Spirit with the Father and Son. On one hand, the Pneumatomachi sect declared that the Holy Spirit was an inferior person to the Father and Son. On the other hand, the Cappadocian Fathers argued that the Holy Spirit was an equal person to the Father and Son. The usage of the word "paraclete" (Greek: parakletos) for the Holy Spirit in John 14:16, which can be translated as advocate, intercessor, counsellor or protector, and the Holy Spirit's essence and action characterized by truth, as all three persons of the Trinity are linked with truth (see v. 17), are seen as arguments that he is a divine person; especially that Jesus calls him another counsellor, in this way expressing that the Holy Spirit is similar to himself in regard to our counsel. More than saying "God does love", the Bible declares "God is love". Love is bound up into the very nature of the Trinity. God cannot be God without love, because God is love (1 John 4:8;16). Without creatures and without the Trinity, God would have once had no objects for his love. There has never been a time when God was not love, for the love among God, the Father, God the Son and God the Holy Spirit has been eternal. The Father and the Son are usually differentiated by age, and later by dress, but this too is not always the case. The usual depiction of the Father as an older man with a white beard may derive from the biblical Ancient of Days, which is often cited in defense of this sometimes controversial representation. However, in Eastern Orthodoxy the Ancient of Days is usually understood to be God the Son, not God the Father (see below)—early Byzantine images show Christ as the Ancient of Days, but this iconography became rare. When the Father is depicted in art, he is sometimes shown with a halo shaped like an equilateral triangle, instead of a circle. The Son is often shown at the Father's right hand. 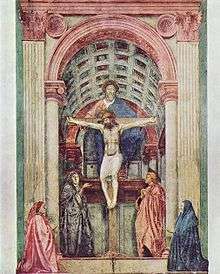 [Acts 7:56] He may be represented by a symbol—typically the Lamb (agnus dei) or a cross—or on a crucifix, so that the Father is the only human figure shown at full size. In early medieval art, the Father may be represented by a hand appearing from a cloud in a blessing gesture, for example in scenes of the Baptism of Christ. Later, in the West, the Throne of Mercy (or "Throne of Grace") became a common depiction. In this style, the Father (sometimes seated on a throne) is shown supporting either a crucifix or, later, a slumped crucified Son, similar to the Pietà (this type is distinguished in German as the Not Gottes) in his outstretched arms, while the Dove hovers above or in between them. This subject continued to be popular until the 18th century at least. Nontrinitarianism (or antitrinitarianism) refers to Christian belief systems that reject the doctrine of the Trinity as not having scriptural origin. Nontrinitarian views differ widely on the nature of God, Jesus, and the Holy Spirit. Various nontrinitarian views, such as Adoptionism, Monarchianism and Arianism existed prior to the formal definition of the Trinity doctrine in AD 325, 360, and 431, at the Councils of Nicaea, Constantinople, and Ephesus, respectively. Following the final victory of orthodoxy at Constantinople in 381, Arianism was driven from the Empire, retaining a foothold amongst the Teutonic tribes. When the Franks converted to Catholicism in 496, however, it gradually faded out. Nontrinitarianism was later renewed in the Gnosticism of the Cathars in the 11th through 13th centuries, in the Age of Enlightenment of the 18th century, and in some groups arising during the Second Great Awakening of the 19th century. Modern nontrinitarian groups or denominations include Christadelphians, Christian Scientists, The Church of Jesus Christ of Latter-day Saints, Dawn Bible Students, Friends General Conference, Iglesia ni Cristo, Jehovah's Witnesses, Living Church of God, Members Church of God International, Oneness Pentecostals, the Seventh Day Church of God, Unitarian Universalist Christians, United Church of God, The Shepherd's Chapel and Spiritism. Islam considers Jesus to be a prophet, but not divine, and Allah to be absolutely indivisible (a concept known as tawhid). Several verses of the Qur'an state that the doctrine of the Trinity is blasphemous. Interpretation of these verses by modern scholars has been varied. Verse 5:73 has been interpreted as a potential criticism of Syriac literature that references Jesus as "the third of three" and thus an attack on the view that Christ was divine. "The Qur'anic interpretation of trinitarian orthodoxy as belief in the Father, the Son, and the Virgin Mary, may owe less to a misunderstanding of the New Testament itself than to a recognition of the role accorded by local Christians (see Choloridians) to Mary as mother in a special sense." There is also debate about whether this verse should be taken literally. For example, Thomas states that verse 5:116 need not be seen as describing actually professed beliefs, but rather, giving examples of shirk (claiming divinity for beings other than God) and a "warning against excessive devotion to Jesus and extravagant veneration of Mary, a reminder linked to the central theme of the Qur'an that there is only one God and He alone is to be worshipped." When read in this light, it can be understood as an admonition, "Against the divinization of Jesus that is given elsewhere in the Qur'an and a warning against the virtual divinization of Mary in the declaration of the fifth-century church councils that she is 'God-bearer'." Judaism traditionally maintains a tradition of monotheism to the exclusion of the possibility of a Trinity. ↑ Augustine had poor knowledge of the Greek language, and no knowledge of Hebrew. So he trusted the LXX Septuagint, which differentiates between κύριοι[Gen 19:2] ('lords', vocative plural) andκύριε[Gen 19:18] ('lord', vocative singular), even if the Hebrew verbal form,נא-אדני‎ (na-adoni), is exactly the same in both cases. ↑ See discussion in Herbermann, Charles, ed. (1913). "Person". Catholic Encyclopedia. New York: Robert Appleton Company. ↑ "Frank Sheed, ''Theology and Sanity''". Ignatiusinsight.com. Retrieved 3 November 2013. ↑ "Understanding the Trinity". Credoindeum.org. 16 May 2012. Retrieved 16 Aug 2016. ↑ "Baltimore Catechism, No. 1, Lesson 7". Quizlet.com. Retrieved 3 November 2013. ↑ Coppens, Charles, S.J. (1903). A Systematic Study of the Catholic Religion. St. Louis: B. HERDER. ↑ "Catechism of the Catholic Church, 253–267: The dogma of the Holy Trinity". ↑ Matt Slick, "The word Trinity is not found in the Bible"
↑ "Lewis and Short: ''trinus''". Perseus.tufts.edu. Retrieved 2 January 2012. ↑ Aboud, Ibrahim (Fall 2005). Theandros an online Journal of Orthodox Christian Theology and Philosophy. 3, number 1. ↑ "Against Praxeas, chapter 3". Ccel.org. 1 June 2005. Retrieved 2 January 2012. ↑ History of the Doctrine of the Trinity. Accessed 15 September 2007. ↑ "Orthodox Outlet for Dogmatic Enquiries: On God". Oodegr.com. Retrieved 2 January 2012. ↑ "St. Ignatius of Antioch to the Magnesians (Shorter Recension), Roberts-Donaldson translation". Earlychristianwritings.com. Retrieved 3 November 2013. ↑ "First Apology, LXI". Ccel.org. 13 July 2005. Retrieved 3 November 2013. 1 2 Bingham, Jeffrey, "HT200 Class Notes", Dallas Theological Seminary, (2004). ↑ Nouveau Dictionnaire Universel (Paris, 1865–1870), Vol. 2, p. 1467. ↑ "Catholic Encyclopedia: article:''Paul of Samosata''". Newadvent.org. 1 February 1911. Retrieved 2 January 2012. ↑ "Athanasius, Bishop of Alexanria, Theologian, Doctor". Justus.anglican.org. Retrieved 2 January 2012. ↑ "Athanasius: De Decretis or Defence of the Nicene Definition, Introduction, 19". Tertullian.org. 6 August 2004. Retrieved 2 January 2012. 1 2 3 "Trinity". Britannica Encyclopaedia of World Religions. Chicago: Encyclopædia Britannica. 2006. 1 2 Stagg, Frank. New Testament Theology. Broadman Press, 1962. ISBN 978-0-8054-1613-8, pp. 38 ff. ↑ Grudem, Wayne A. 1994. Systematic theology an introduction to biblical doctrine. Leicester, England: Inter-Varsity Press. Page 226. ↑ "Athanasian Creed". Ccel.org. Retrieved 2 January 2012. ↑ Barth, Karl, and Geoffrey William Bromiley. 1975. The doctrine of the word of God prolegomena to church dogmatics, being volume I, 1. Edinburgh: T. & T. Clark. Pages 348–9. ↑ Thomas, and Anton Charles Pegis. 1997. Basic writings of Saint Thomas Aquinas. Indianapolis, Indiana: Hackett Pub. Pages 307–9. ↑ For 'person', seeRichard De Smet, A Short History of the Person, available in Brahman and Person: Essays by Richard De Smet, ed. Ivo Coelho (Delhi: Motilal Banarsidass, 2010). ↑ "NPNF2-09. Hilary of Poitiers, John of Damascus | Christian Classics Ethereal Library". Ccel.org. 13 July 2005. Retrieved 2 January 2012. ↑ Pontifical Council for Promoting Christian Unity: The Greek and the Latin Traditions regarding the Procession of the Holy Spirit (scanned image of the English translation on L'Osservatore Romano of 20 September 1995); also text with Greek letters transliterated and text omitting two sentences at the start of the paragraph that it presents as beginning with "The Western tradition expresses first ..."
↑ "Basil the Great, De Spiritu Sancto, NPNF, Vol 8". Ccel.org. 13 July 2005. Retrieved 2 January 2012. ↑ Rubinstein, Richard. When Jesus Became God, The Struggle to Define Christianity During the Last Days of Rome. p. 64. ↑ N.S.Gill, "The Arian Controversy and the Council of Nicea"
1 2 Rusch, William G. (1980). "Introduction". In Rusch, William G. The Trinitarian Controversy. Minneapolis: Fortress Press(subscription required). p. 2. ↑ "Neither the word Trinity nor the explicit doctrine appears in the New Testament ... the New Testament established the basis for the doctrine of the Trinity"(Encyclopædia Britannica Online: article Trinity). ↑ "Trinity". Britannica.com. Retrieved 2 January 2012. 1 2 The Oxford Companion to the Bible (ed. Bruce Metzger and Michael Coogan) 1993, p. 782–3. ↑ See, for instance, the note in 1 Jn 5:7–8. ↑ "The Presentation of Jesus in John's Gospel". Bbc.co.uk. Retrieved 2 January 2012. ↑ St. Paul helps us understand truths about Jesus Archived 26 March 2009 at the Wayback Machine. ↑ St. Augustine of Hippo,De Trinitate, Book I, Chapter 3. 1 2 3 4 St. Basil the Great,On the Holy Spirit Chapter 16. ↑ St. Basil the Great, On the Holy Spirit Chapter 19. ↑ St. Basil the Great, On the Holy Spirit Chapter 21. ↑ "Catholic Encyclopedia: article ''Pneumatomachi''". Newadvent.org. 1 June 1911. Retrieved 2 January 2012. ↑ New Jerusalem Bible, Standard Edition published 1985, introductions and notes are a translation of those that appear in La Bible de Jerusalem—revised edition 1973, Bombay 2002; footnote to Joh 14:16. ↑ Zondervan NIV (New International Version) Study Bible, 2002, Grand Rapids, Michigan, USA; footnote to Joh 14:17. ↑ Trinity—see "3 The Holy Spirit As a Person". 1 2 "Catholic Encyclopedia: article ''The Blessed Trinity''". Newadvent.org. 1 October 1912. Retrieved 2 January 2012. 1 2 3 "Francis Watson, Abraham's Visitors, The Journal of Scriptural Reasoning, Number 2.3, September 2002". Etext.lib.virginia.edu. Retrieved 2 January 2012. ↑ Swedenborg, Emanuel. Heavenly Arcana, 1749–58. Rotch Edition. New York: Houghton, Mifflin and Company, 1907, in the Divine Revelation of the New Jerusalem (2012), n. 2149, 2156, 2218. ↑ The Trinity in the Old Testament Archived 9 December 2010 at the Wayback Machine. ↑ "Baker's Evangelical Dictionary of Biblical Theology: ''Angel of the Lord''". Studylight.org. Retrieved 2 January 2012. ↑ Cross, F.L. (1958). The Oxford Dictionary of the Christian Church. London: OUP, p. 81. 1 2 Glassé, Cyril; Smith, Huston (2003). The New Encyclopedia of Islam. Rowman Altamira. pp. 239–241. ISBN 0759101906. ↑ Mun'im Sirry (1 May 2014). Scriptural Polemics: The Qur'an and Other Religions. Oxford University Press. ↑ S. Griffith: Christians and Christianity. ↑ Edward Hulmes: Qur'an and the Bible, The; entry in the Oxford Companion to the Bible. ↑ Mun'im Sirry (1 May 2014). Scriptural Polemics: The Qur'an and Other Religions. Oxford University Press. p. 47.